Knowing that the rollout of new draft zoning maps would send tempers flaring, Austin Mayor Steve Adler encouraged the public to “chill out” upon their April release. But so far the city’s CodeNext zoning overhaul process continues to provoke strong reactions, virtually from all sides. Neighborhood preservationists, like the Austin Neighborhoods Council, worry the new code will dramatically increase density in residential neighborhoods. Urbanist groups like AURA think the plan doesn’t go far enough in addressing the city’s affordability crisis. Council Member Ann Kitchen is encouraging patience. The zoning code released in February and the maps released in April are only drafts. Both are going through public comment periods now; the planning and zoning commissions will produce new drafts by the end of the year, and council won’t vote on a final version until spring 2018. “I would say we’re in the early stages of an iterative process,” says Kitchen. Nonetheless, Eric Goff of AURA worries there’s a lot of work ahead. “It’s possible to redeem it, and we’re going to really try our hardest to do that, but without significant revision to the code and to the maps, it could even be a worse outcome [than what we have now],” he says. Austin’s current code is, he says, “completely onerous.” On this point, most everyone agrees. Decades of adding conditional overlays to the base zoning has created layer upon layer of complexity, making the code difficult to navigate, even for something as simple as adding a porch to a single-family home. “Finding what you’re allowed to do and what you’re not allowed to do is like a treasure hunt,” says Kitchen. After a comprehensive plan update failed in the ’80s, individual neighborhoods were permitted to draft their own land use plans, which now layer awkwardly on top of the existing code. Jen Todd, a senior planner in Austin’s planning and zoning department, gives the following example: A property may have base commercial zoning, with an overlay for mixed-use development, and then a conditional overlay on top of that as part of a neighborhood plan. In the current code, the requirements for all of those layers would be found in different sections. “When it’s hard to use, that means it’s a more lengthy and expensive process both for neighbors and for developers. It’s very clunky, it doesn’t work well,” says Kitchen. It also doesn’t serve the needs of a city that is growing rapidly. Housing is quickly becoming unaffordable to many in Austin, a city dominated by single-family homes and lacking a strong public transportation network. Austin updated its comprehensive plan in 2012. 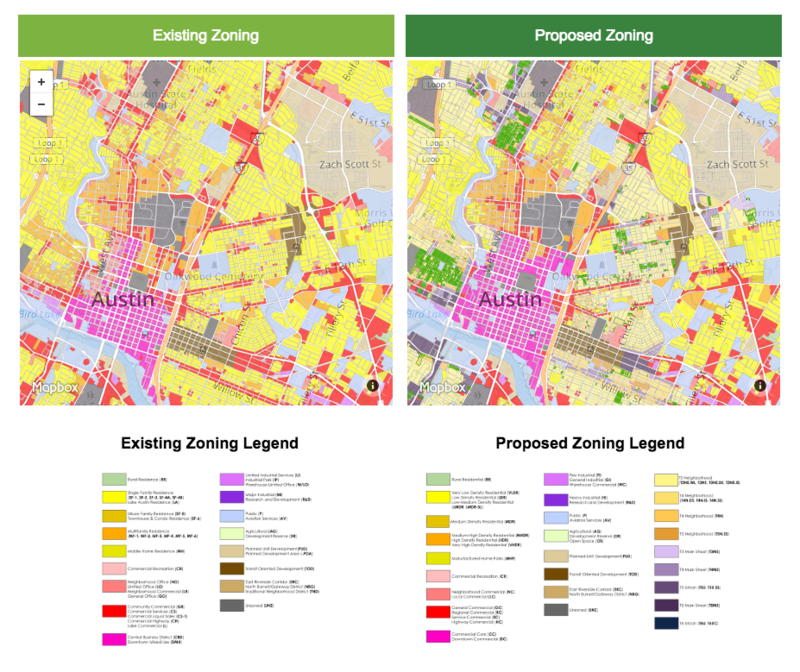 The CodeNext zoning overhaul is intended to help the city achieve the goals laid out in that new vision, called Imagine Austin. Those goals include promoting multimodal transit, affordability, and a more compact and connected city. Jeb Boyt, of the Alliance for Public Transportation, thinks CodeNext is on the right track for some of these goals. He’s happy that the draft promotes a system in which denser housing is concentrated around neighborhood centers that would be linked by transit corridors. He’s glad those corridors and the center city overall now have a form-based code. But he thinks the plan still fails to categorize as “centers” some areas that clearly are, which means they wouldn’t get the denser housing he thinks they need. Goff agrees that the plan still makes it too difficult for the city to add “missing middle housing” — including smaller unit sizes and residential property add-ons such as backyard cottages or granny flats. The draft reduces parking requirements, but Goff still thinks they’re too high. And there’s plenty of little details he takes issue with, and has submitted as comments: New dimension requirements for buildings could threaten heritage trees, for examples, and a new 10-foot ceiling height requirement would make construction more expensive. Todd says the length and number of types are actually a product of the draft code’s clarity. Remember that mixed-use commercial property with a neighborhood plan overlay? To renovate such a lot under existing code, one would need to seek out the requirements for each layer in a different section. CodeNext has instead created a new type of zone that tries to achieve what that string of layers was striving for. No more flipping chapter to chapter to understand what’s possible on a property, but that means the draft also has a lot more repetitive language, adding to its length. Right now, the city is receiving comments on the draft maps. Comments on the zoning document, and a series of public information sessions, ended last week. In them, the city heard from both sides: urbanists like Goff and Boyt, and neighborhood preservationists like Mike Lavigne of the Austin Neighborhoods Council. He told KXAN he worried the code would allow for triplexes to be built in his neighborhood. “This would essentially increase that by 50 percent, the number of units allowed on a lot, and then decrease the parking by about 50 percent,” he said. He also felt the code would not respect his neighborhood’s plan. “That’s something we worked very hard on as a neighborhood and is not respected in the new code,” he said. Todd says CodeNext is required to incorporate neighborhood plans, not dismiss them, and so far that’s how it’s drafted. For urbanists, that’s the problem: Many of the neighborhood plans were more concerned with protecting a certain character than promoting affordability. Boyt thinks the draft can be amended to satisfy those needs, depending on how CodeNext staff respond to public comment. Goff isn’t feeling optimistic. Kitchen suggests all of this is premature. There’s plenty of time, she says, to get this right.